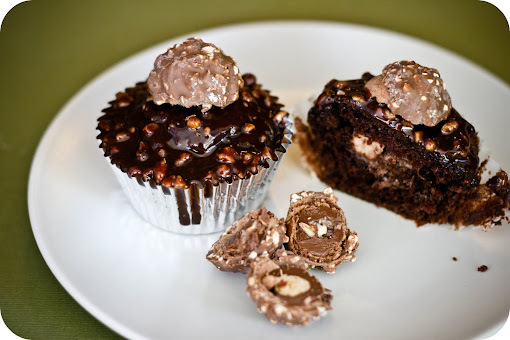 I don't know if you've noticed or not, but I'm really obsessed with hazelnuts and Ferrero Rocher chocolates. I've put them in brownies, in cheesecakes, you name it. Surprisingly, I haven't tried them in cupcakes... until now. Can we bask in the beauty of these things?! Let's allow a good 5 seconds of pure unadulterated viewing. Ok, now that that is over with... how could these not be good? If you love chocolate (check!) and if you love hazelnuts (check! ), then this is for you!! Original recipe from 6 Bittersweets, which can be found here. Preheat oven to 350 F. In a bowl, whisk the boiling water into cocoa until smooth and whisk in the yogurt, molasses, vanilla and hazelnut extracts. In a large bowl beat together the butter and sugar until light and fluffy, about 2 - 3 minutes and beat in the eggs, one at a time, beating well after each addition. Into another bowl, sift together the flour, baking powder and salt and add to the egg mixture in batches alternately with the cocoa mixture, beginning and ending with the flour mixture. Beat well after each addition. Fill each wrapper about 1/2 way since they will rise a lot. Bake for 15 - 20 minutes or until an inserted toothpick comes out clean. Cool completely. 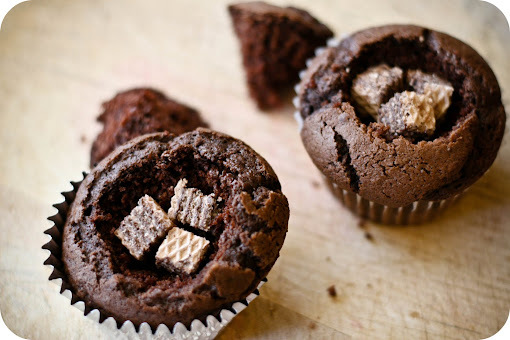 If desired, cut a cone into the cupcake and fill the hole with a tsp. of Nutella. If using, place a couple of chopped hazelnut wafer cookies into the center then place the top back on and push slightly to secure. For the ganache, heat the cream on the stove until it boils. Pour over the chocolate and stir to melt, adding the corn syrup and hazelnut extract. Stir in the chopped hazelnuts. 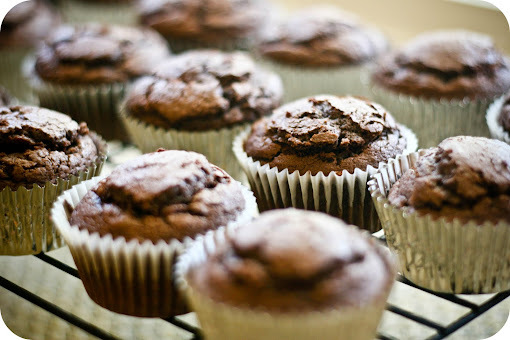 Once it has cooled and thickened slightly, use a spoon to spread over the tops of the cupcakes. 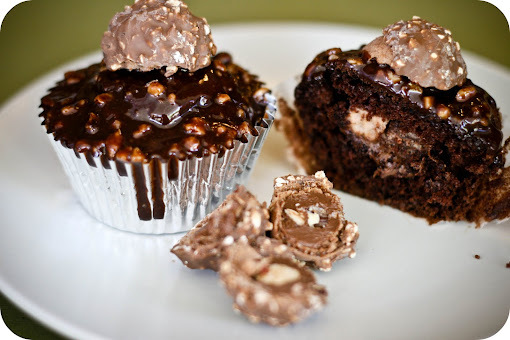 Top with half of a Ferrero Rocher and enjoy! YUMMM! Can ya see the filling?!?! Can ya, can ya??!?! Those are just amazing.. like a piece of true chocolate hazelnut heaven! yum! I love the chocolate / hazelnut combo probably better than PB & chocolate. These look so adorable! And delicious! Oh ambassador you are really spoiling us! I can't wait to make these myself. They look absolutely mouth-watering. I am so making these! Yummy! Glad these turned out & love your photos! Don't be surprised if you win a few fans with these. A friend of a friend even asked to buy a dozen :). These look fantastic and so sinful! I love how crispy Ferrero Rocher candies are. 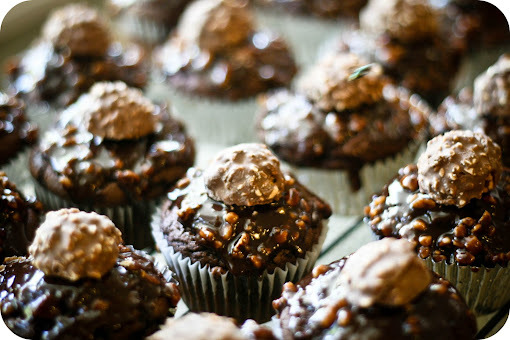 I might just have to make these today, they look absolutely delicious! Karolyn my children's sitter would TOTALLY love these! She loves chocolate. Through some hazelnuts in it and she's over the moon. I'm thinking she needs some a few of these to keep her happy! Where did you buy the hazelnut extract? Hello - I have the same question as posted above but didn't see the answer, where can I find hazelnut extract? Can I substitute Kahlua liqueur (coffee liqueur)? 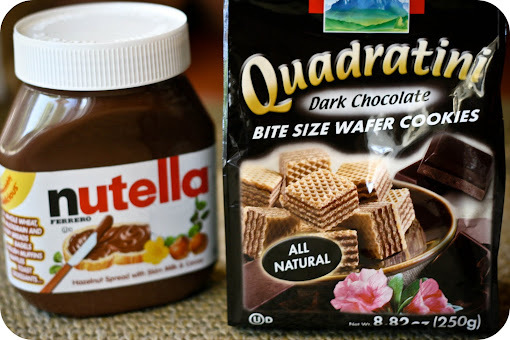 Anonymous: I actually put a dollop of nutella in the center, then topped it with some cut up wafers. The wafers weren't in the original recipe so I must have forgot to add them in the post, but it is adjusted now. are these mini or regular sized cupcakes? is the yogurt supposed to be natural? or vanilla flavored?